In a bowl, stir along ready-mix, butter, and juice till well combined. Press into a lubricated 9" springform pan. Set aside. In a bowl, beat cheese and sugar till light-weight and creamy. Add cream, vanilla, juice, and zest of 1 lemon and blend well. combine in eggs simply till combined - don't over combine. Pour over crust and bake 45-50 minutes or till set however slightly jiggly. enable to chill utterly, then cowl and chill a minimum of four hours. If desired, pipe ice round the fringe of the cheesecake. Sprinkle the zest of 1 lemon over the complete cheesecake. Store lined within the icebox. 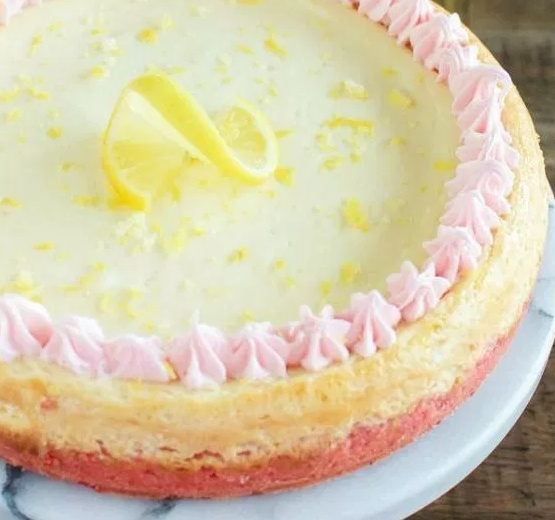 0 Response to "Lemon Cheesecake with Strawberry Crust"